Nathaniel Dwayne Hale (born August 19, 1969 in Long Beach, California; died March 15, 2011 in Long Beach, California), better known by his stage name Nate Dogg, was a Grammy-nominated American singer and occasional rapper. He was known especially for his one of a kind hooks and vocals, and like they say: "it ain't a hit until Nate Dogg spit". After serving in the US Marine Corps for three years he returned to California and formed the rap group 213 with his cousin Snoop Dogg and friend Warren G. He was soon signed to Death Row Records along with Snoop, and he made his debut on Dr.
Dre's 1992 album The Chronic. Singing in what would later become his trademark style, he was well-received by fans and critics alike, and in 1994 he produced his first hit single "Regulate" with Warren G. Nate Dogg released his debut album under Breakaway Records in 1998 after a tumultuous time at Death Row Records. The double album was titled G-Funk Classics Vol. 1 & 2 and was followed up in 2001 with Music & Me on Elektra Records, 2002's Essentials and 2003's Nate Dogg. Also he was featured on the hit single 'Shake That' from Eminem's fifth studio album Curtain Call. 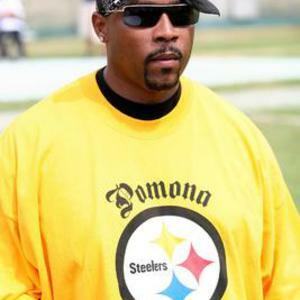 Nate Dogg was a West Coast icon, and he tragically passed away on the morning of March 15, 2011. R.I.P. Nate you will be missed.